Using the Aureolin Yellow mixture, I painted some reflections into the plate and bowl. I cannot emphasize enough to use a light touch. Look at the reference before you add color. Only put the color where you really see it. Keep the value of the tones in mind as well as the shape of the areas to be painted. Also pay attention to the edges. If your edges need to be soft, apply the pigment, then use a clean, damp brush and soften the edge very gently with moisture. 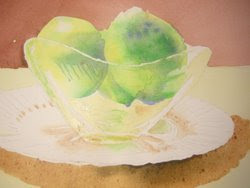 Don't over brush or your subsequent layers of color will be applied to a fuzzy surface and you will lose the crispness of the reflections in the glass. The idea is to study your photo reference and understand it, look more than you paint. If you aren't sure, don’t paint it.